Located in the northeast part of Russia, the Siberian Tundra is a chilly place able to reach a temperature as low as -40 degrees Celcius. Due to special weather conditions, living beings on the tundra must adapt to survive. This results in very unique plants such as the arctic moss, arctic willow, bearberry, caribou moss, labrador tea, and more. Not just the plants, adapting to the extreme conditions as well are many unique animals that lives in Siberian Tundra. There are many things to do in Siberian Tundra and wildlife viewing is one of it! With a thick fur to adapt to the cold environment, the arctic fox preys on smaller animals and feeds on plants such as berries. They are able to adapt to the most extreme of environments and only start to have problems when the temperature drops below -70 degrees Celcius. To survive in the cold, the arctic fox hides in their dens or tuck themselves in to minimize heat loss. Arctic foxes also keeps their excess meals in their dens to survive when the weather gets worse and food becomes harder to find. Unless threatened, the arctic fox generally aren’t harmful to humans. The polar bears might look white, but their furs are actually clear instead of white. With dual layers of fur, they are able to withstand the worse of conditions and retain their heat. However, should they run for a prolonged period of time, they will overheat and suffer complications. 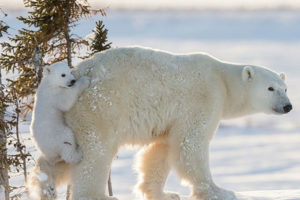 The polar bears can be dangerous and aggressive when something tries to harm its cubs so caution is advised. Although polar bears are well known all over the world, it is currently categorized as endangered with only 22,000 – 31,000 left. 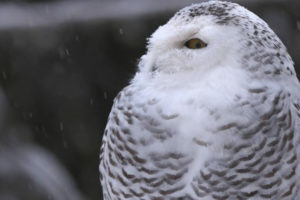 Naturally nocturnal animals, snowy owls hunt at night and sleep during the day. However, during certain times of the year, such as summertime, this animal may be active during the day as well. Snowy owls reside in many regions including Alaska, Northern Canada, and Eurasia. Snowy owls live in tree tops or high areas in general so they can watch for predators. These birds themselves prey on other animals such as rodents, insects and sometimes they eat decaying flesh of dead animals. Snowy owls do not hibernate and are active all winter long. Caribou is the reindeer of the tundra able to weigh up to 300 kg (for males) or 90 kg (for females). Caribous move across the tundra to search for their food which consists of a variety of plants such as willow leaves, mosses and herbs. During winter time, they feed on lichen and fungi to survive instead. 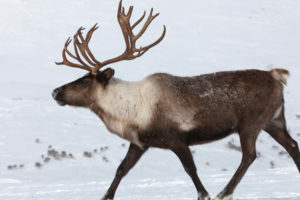 Caribou can smell the lichen buried under the snow and often uses their hooves and/or antlers to shove the snow away. Their hooves adapt towards the season changes with fleshy sponge-like footpads on summer and hairy sharp hoof on winter to protect themselves from the cold. The caribou are generally harmless unless their young are threatened. These short-tailed weasels might look cute, but they’re a swift and ferocious predator. Ermines can grow up to 13 to 29 cm in head and body length and weighing less than 0.3 kg. 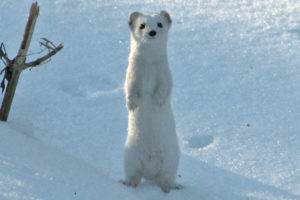 Ermine hunts small animals, birds, eggs, frogs, and eats fruits and vegetables. Some examples of the small mammals that ermine eats are squirrels, rats, rabbits, and when necessary, they consume decaying carcasses just like snowy owls. In summer, ermines coat are brown with white color on their throat down to their belly. 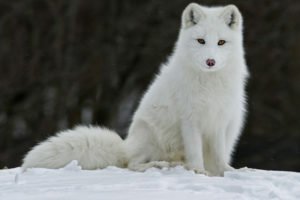 With these white coats, they are able to blend into their surroundings and move easily. Ermines are sneaky animals and careful predators, often catching their prey off guard. However, there is no need to worry when it comes to the relationship between ermines and humans. Ermines are not dangerous nor life-threatening to humans. The herbivorous musk oxen lives in herds and can grow up to 110 – 150 cm tall at the shoulder and weighing up to 410 kg. The herd consists of up to three dozens of animals and are protective of their kind when threatened. Musk oxen’s diet consists of whatever is available such as lichens and mosses in winter. Meanwhile, during summer, musk oxen will eat willow shoots, flowers, grasses, and others. Musk oxen are able to live anywhere in any sorts of harsh environment due to their coat. However, these animals in general do no stray far from their home range where food and water are available. 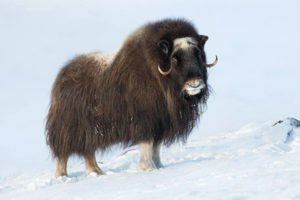 The musk oxen have both an outer coat and an inner coat. Their outer coat are made of long hairs which are brown in color. Meanwhile, their inner coat are made of wool-like materials. Their predators are arctic wolves, with occasional grizzly bears and polar bears. To summarize, there are many wonderful animals that lives in Siberian Tundra. If animal sightseeing is now in your bucket list, there are many other things to see when visiting Russia such as Mosque in Moscow, Russia and Catherine Palace. Also, if you’re visiting Russia, do not forget to check the Best Time to Visit Russia and Tips to Do Cheap Travelling to Russia. Enjoy your trip and have fun in Russia!